Madurai is one of the oldest cities of India, with a history dating all the way back to the Sangam period of the pre Christian era. The glory of Madurai returned in a diminished form in the earlier part of this millennium; it later onMadurai came under the rule of the Vijayanagar kingdom after its ransack by the ravaging armies of Delhi (Malik Kafur). During the 16th and 18th centuries, Madurai was ruled by the Nayak Emperors, the foremost of whom was Tirumalai Nayakar. The Sangam period poet Nakkeerar is associated with some of the Tiruvilayaadal episodes of Sundareswarar – that are enacted as a part of temple festival traditions even today. The Sangam age or the Golden age of Tamil literature – produced masterpieces way back in the Pre christian era and in early 1st millennium. Madurai was the seat of the Tamil Sangam or Academy of learning. The entire city of Madurai, is built around the Meenakshi Sundareswarar Temple – the temple par excellence. Concentric rectangular streets surround the temple, symbolizing the structure of the cosmos. The Cholas ruled Madurai from 920 AD till the beginning of the 13th century. In 1223 AD Pandyas regained their kingdom and once again become prosperous. Pandian Kings patronised Tamil language in a great way. During their period, many master-pieces were created. “Silap athikaram” the great epic in Tamil was written based on the story of Kannagi who burnt Madurai as a result of the injustice caused to her husband Kovalan. In April 1311, Malik Kafur, the general of Alauddin Khilji who was then the ruler of Delhi, reached Madurai and raided and robbed the city for precious stones, jewels, and other rare treasures. This led to the subsequent raids by other Muslim Sultans. In 1323, the Pandya kingdom including Madurai became a province of the Delhi empire, under the Tughlaks. The 1371, the Vijayanagar dynasty of Hampi captured Madurai and it became part of the Vijayanagar empire. Kings ofMadurai this dynasty were in habit of leaving the captured land to governors called Nayaks. This was done for the efficient management of their empire. The Nayaks paid fixed amount annually to the Vijayanagar empire. After the death of Krishna Deva Raya (King of Vijayanagar empire) in 1530 AD, the Nayaks became independent and ruled the territories under their control. Among Nayaks, Thirumalai Nayak (1623-1659) was very popular, even now he is popular among people, since, it was he who contributed to the creation of many magnificent structures in and around Madurai. The Raja Gopuram of the Meenakshi Amman Temple, The Pudu Mandapam and The Thirumalai Nayakar’s Palace are living monuments to his artistic fervor. Madurai started slipping into the hands of the British’s East India Company. In 1781, British appointed their representatives to look after Madurai. George Procter was the first collector of Madurai. 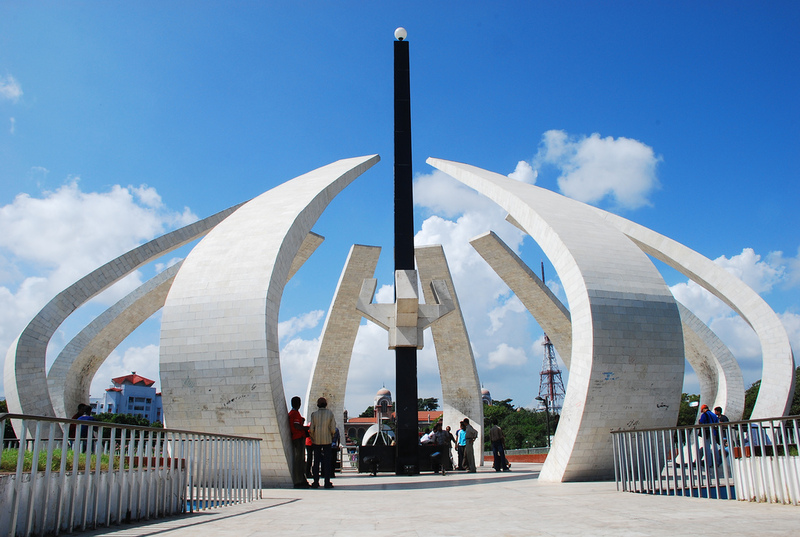 Now after India’s independence, Madurai is one of the major districts of Tamilnadu State. Later on Madurai district was bifurcated into two districts namely Madurai and Dindugul Districts. In Madurai District, there are 15 State Assembly constituencies and two parliament constituencies. The history of Madurai will not be complete without mentioning the name of Rani Mangammal, the woman of great skill and sagacity. History does not provide many instances of ruling queens in Tamil Nadu. Though it was considered that women were not suited to succeed the throne of a kingdom, Rani Mangammmal, however shines in almost solitary eminence as an able and powerful ruler in Tamil Nadu. Madurai is famous for its temples.The Aappudaiyaar Koyil Tevara Stalam and the Koodalazhagar Divya Desam are the most important temples one should rarely miss to go. 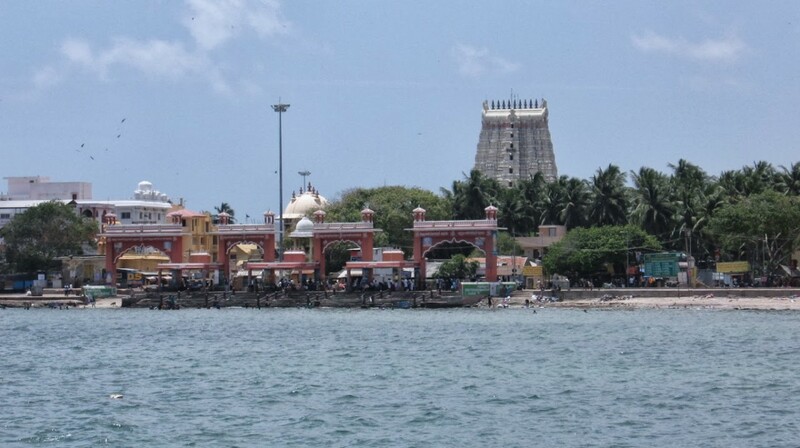 In the vicinity of Madurai is Tirupparamkunram, one of the 6Madurai padai veedu shrines of Murugan (glorified in Madurai Sangam Nakeerar’s Tirumurugaatruppadai). Also in the vicinity of Madurai is Alagar Koyil, one of the prominent Divya Desam shrines of the Sri Vaishnavite faith. By Air: There are daily flights to Madurai from Chennai, Bangalore,Tiruchi & Coimbatore. Madurai Airport is 10 Kms away from Madurai City. 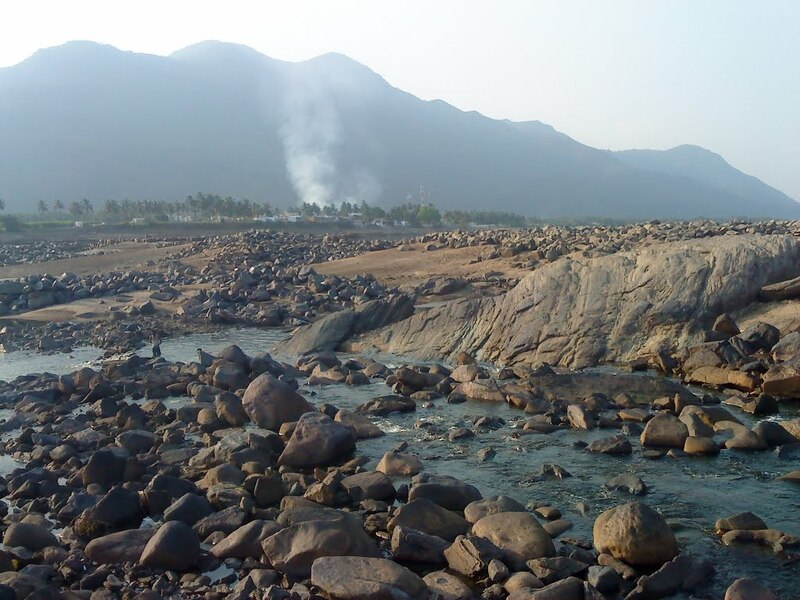 By Train: Madurai is an important railway junction of the Southern Railway and is directly connected to Chennai and Tirunelveli. Madurai is on the Madurai-Tiruchirappalli-Dindigul-Quilon line. The Vaigai Express, which is a super-fast day train between Chennai Egmore and Madurai takes 7 hours for the 495kms. By Road: There are excellent roads connecting Madurai to all parts of South India. Madurai City has 5 Major Bus Stand. Madurai Masala, a world of fine Indian Cuisine with uncompromised hospitality, proudly offers freshly made to order North and South Indian dishes that let you experience the authentic taste of traditional Indian cuisine. Madurai Masala is conveniently located in the heart of Gaithersburg, near to north of Lake Forest Mall. Madurai Masala is an employee owned restaurant and the chef has more than 20 years of industry experience to make tasteful authentic Indian food. Masala is a freshly grinded spice that we use in all curries. We make unique varieties of Indian food which are marked with the trademark of “Madurai Masala”. Madurai Masala has extensive bar area with spectacular view inside and offers different varieties of Beers and Wines. Madurai Ordering food at Madurai Masala is so convenient for you. Please order through our system and save time and money. Please call us to schedule a pick up after placing the order. Madurai Masala offers 20% discount for Anniversary and 15% discount for Birth Days. Please to sign up and get promotional offers & disocunt coupons. Madurai is known for its possibilities for textile shopping. Best quality cotton dresses are available in Madurai. Puthu Mandapam is an important place one can buy printed cotton fabric. As in the other parts of India Madurai is also famous for a shopping of bargaining. The major handicrafts shops are situated near the temple. The Theppam festival is one of the popular festivals in Madurai. Theppam literally means float, which is usually conducted in the months of January and February according to the local calender. The devotees are floating the decorated images of deities on the pond. Mainly the worshipped deity is Goddess Meenakshi and Sundareswar, the incarnation of Lord Siva. Chitrai Festival is yet another festival that brings masses into the heights of Bhakthi and delight. This festival is a commemoration of the celestial marriage of Meenakshi and Siva. The deities are being carried around the city in big chariots pulled by people. The season of this festival is April / May. The festival lasts to 14 days. Avanymoolam is celebrated to proclaim the coronation of Lord Siva in every September. Navaratri Festival, which lastsMadurai upto nine days, is to worship Goddess Durga, held in September / October. Location: The historical and temple city of Madurai is located in Tamil Nadu in South India. Madurai is situated in the southern part of Tamil Nadu. Madurai is 150 km from Tiruchirappalli. Madurai is on the banks of Vaigai River. Climate: Madurai enjoys a moderate tropical climate. The average temperature of Madurai is 34 – 38 degree Celsius. The atmosphere is some times humid. The Past: According to the allusions of earlier Tamil literary pieces belonging to the 3rd century BC, the city of Madurai has had a legendary origin. It is believed that Goddess Meenakshi, an incarnation of Goddess Parvati, was born as the daughter of a Pandyan king. It was a boon to the king by the Goddess who did not have a child. Later Goddess Meenakshi ascended the throne and became the protector of Madurai city. She was a great warrior and when she defeated her last rivals in the Battle of Kailash, Lord Siva appeared there and married her. Then they both were remained as the rulers and thus protected Madurai. We can also find another major allusion in the Tamil epic “Silapathikaram” of the great poet Ilanko Adikal. In the later phase, Madurai was the headquarters of the Great Nayaks, the mighty dynasty ruled over the area. Madurai City has had a cultural and commercial importance from the time immemorial. The city has constructed in the form of Lotus flower. 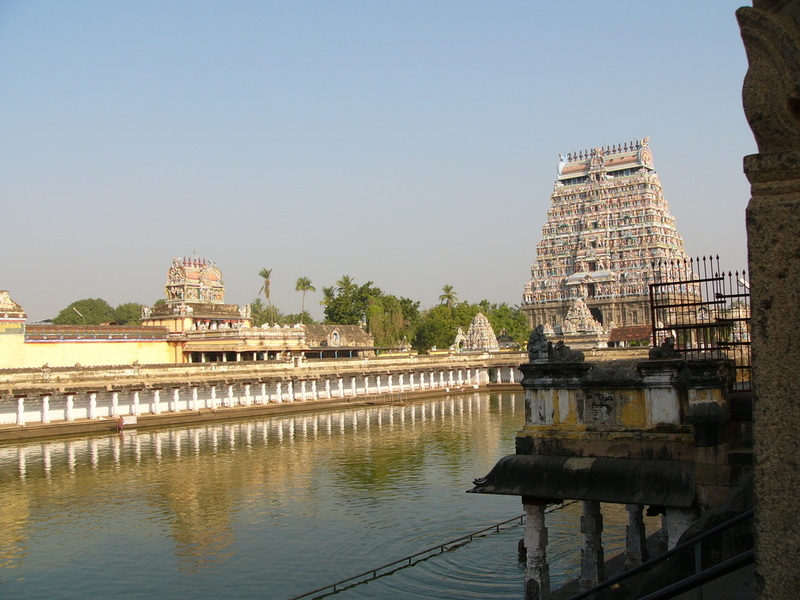 The very name Madurai conjures up is the Meenakshi Temple, which is the major landmark of city. Madurai is the second oldest city in India, which is almost 2500 years old. Madurai was the seat of Tamil learning. And still Tamil as aMadurai spoken language can be found in its most pure form in Madurai only. 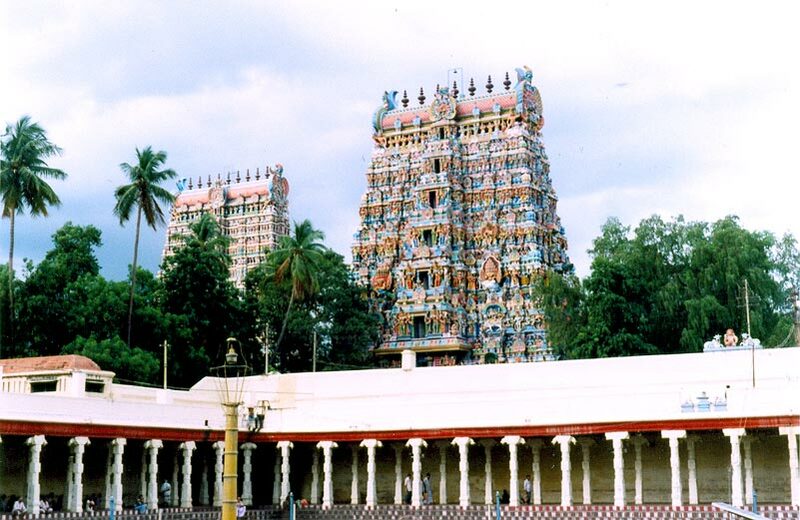 Sites to Visit: The main city revolves around the Meenakshi Temple, which is a fine example of Dravidian architecture. 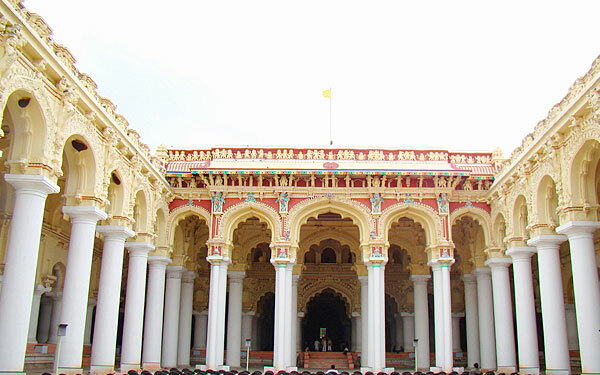 The temple has designed in 1560 AD and it was built at the reign of Thirumalai Nayak. The temple is situated in an area of six hectors. Four Gopurams of the Temple beautifies the aerial view of the city. The Gopurams have been decorated with numerous multicoloured sculptures of gods, goddesses, other deities and demons. Non-Hindus are also allowed to visit the temple except near the Sanctum Sanctorum. The 1000-pillared hall consists of stone figures carved brilliantly and they are also the music pillars. The temple has 12 towers out of which the Southern tower is the tallest. One can have a glimpse of the whole temple complex from the top of Gopuram. The temples usually opens early at 5 a.m. to 12.30 p.m. and re-opens at 4 p.m. to 9.15p.m. In the premises of the temple there is a Temple art museum situated. Just 01 km away to the temple one can visit the Tirumalai Nayak Palace, which is a protected monument under Archeological Survey of India. 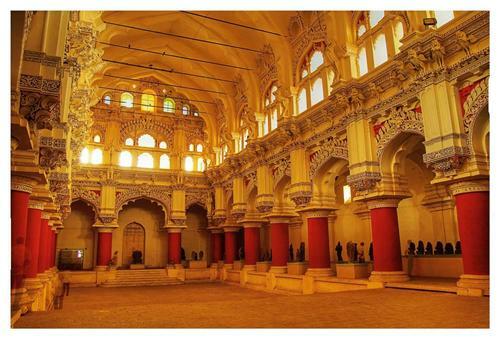 The palace is a very good example of Indo-Saracenic architecture. This Palace has an entrance gate, main hall and a dance hall. The rectangular courtyard is known as Swargavilasa. 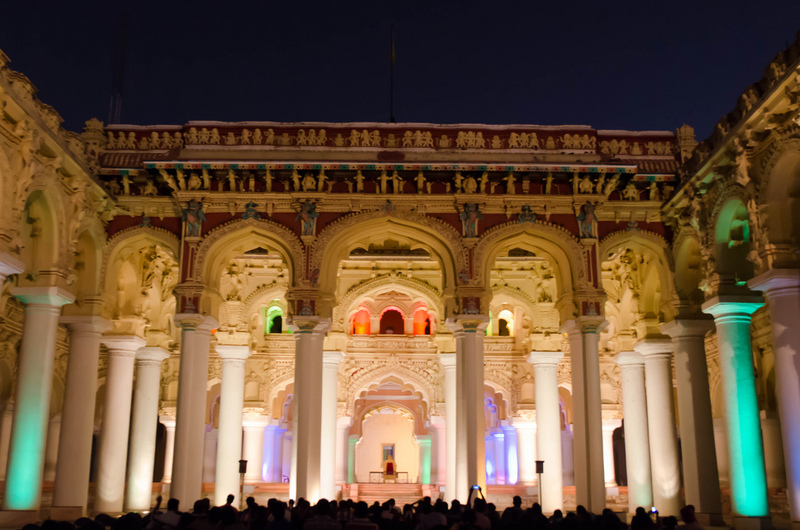 There is a live light and sound show conducted everyday, both in English and Tamil at 6.30 and 8 pm respectively. 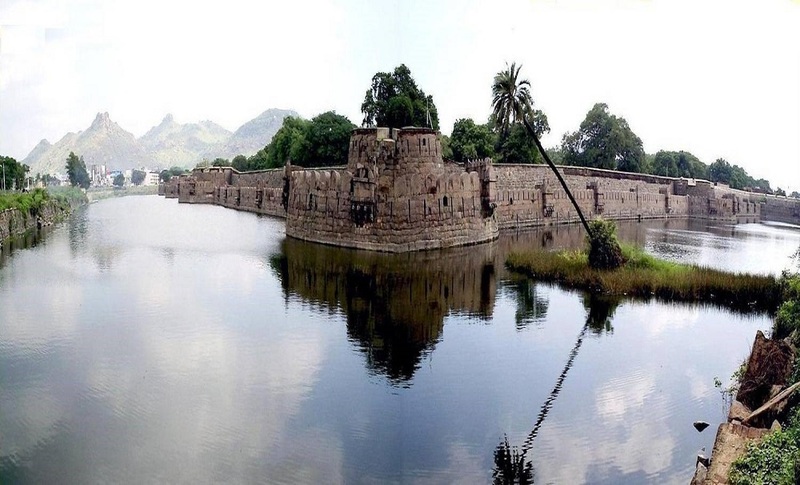 The famous ruler Tirumalai Nayak built the Teppakkulam tank in the vicinity of city. The Tank is as big as the size of Meenakshi temple complex. The peculiar thing to be noted is that the tank is connected to the Vaigai River through underground channels. The palace of Maharani Mangammal had been converted into the Gandhi Museum where one can get a clear vision of Indian history, especially the freedom struggle. Sites Near by: The Thiruparankundram Temple, situated 8 km south of Madurai, is one of the architectural marvels of Madurai. This is a rock-cut temple. The temple is dedicated to Lord Muruga. 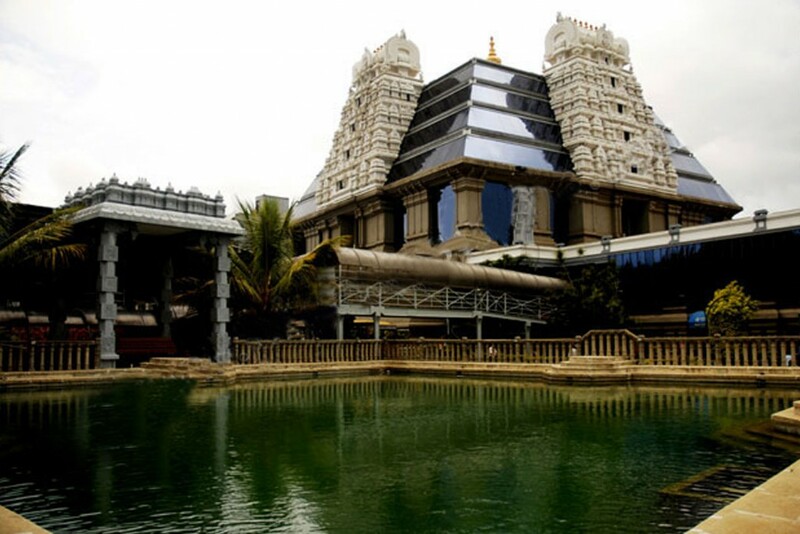 A mythological reference says that the temple is one of the six abodes of Lord Muruga. 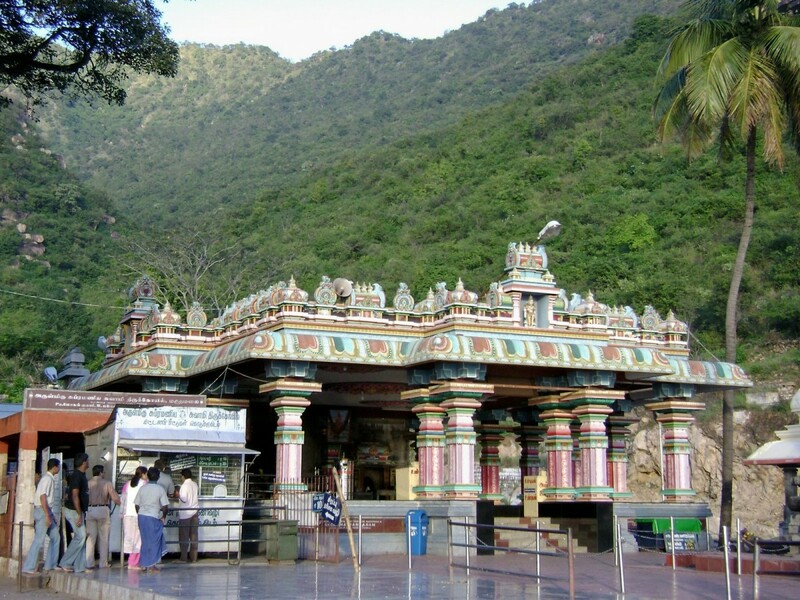 Alagar coil temple is located at 21 km north of Madurai. 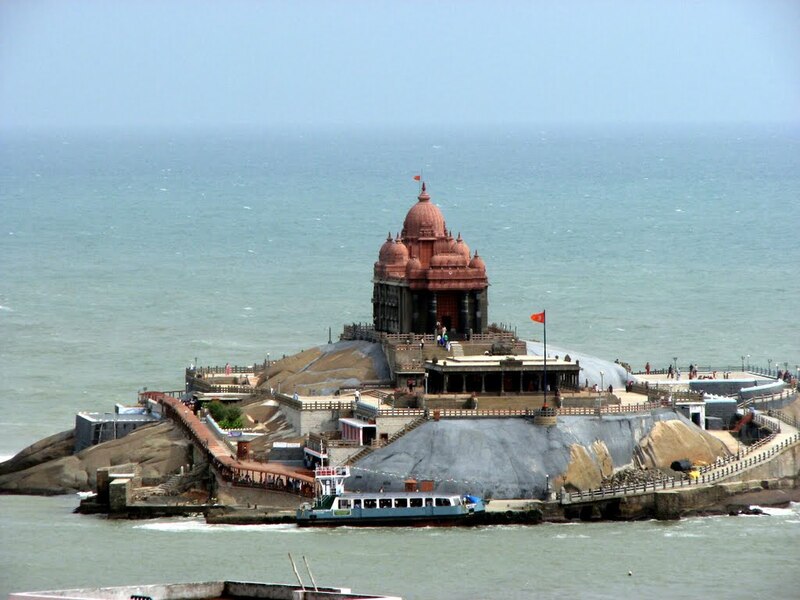 This magnificent temple is dedicated to Lord Alagar, an aspect of Vishnu. This temple is a good example of Dravidian architecture. Madurai: The ‘Kalthoon Maiyya Mandapam’ or simply the pillar hall located on the Vaigai riverbed that was full of shrubs and garbage got a new look, thanks to the efforts of M. Eswaran, Commandant, Tamil Nadu Special Police (Sixth Battalion) in Madurai. In a bid to infuse life into the dilapidated structure, Mr. Eswaran deployed dozens of police personnel to clear the mandapam. It was renovated and given a whitewash ahead of the Chithirai festival. A day before Lord Kallazhagar entered the river, lights were installed giving a illuminating look to the hall.“The 500-year-old mandapam has a Maduraihistorical significance. In the olden days, major events, including Lord Kallazhagar entering the river, were witnessed by kings from this hall. Every pillar is an architectural marvel. It was considered auspicious to organise betrothals here,” Mr. Eswaran said quoting informed sources. Appealing to the authorities to develop and promote the hall as a place of tourism importance, he said the TSP would be happy to adopt it if given an opportunity. “If superior officers in the Armed Police permit, we will be ready to adopt the mandapam,” he added.